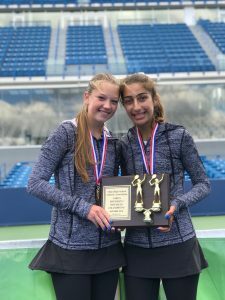 This dynamic duo were crowned Division I State Tennis Doubles Tournament Champions last Saturday at the Lindner Family Tennis Center in Mason for the second consecutive year! Atway and Schoenly defended their title by beating Mason’s Raina Chada and Annie Kruse 6-0, 6-2 in the semi-final match then Mayfield’s Hannah Kassaie and Caitlyn Hsu 6-2, 6-3 in the Championship match. They never lost a set in their four matches in the State Tournament. Congratulations Maddie and Dani on this outstanding accomplishment!